Buster Keaton's Kennel on the MGM lot was likely built in late 1930. This photo shows the back of the Kennel, and part of the New York set where he filmed The Cameraman (1928). Very nice John. One question though, in those 1930 aerial shots, can we see the offices across the street from MGM where Keaton first housed himself and his production staff when he made THE CAMERAMAN for MGM? Richard M Roberts wrote: Very nice John. 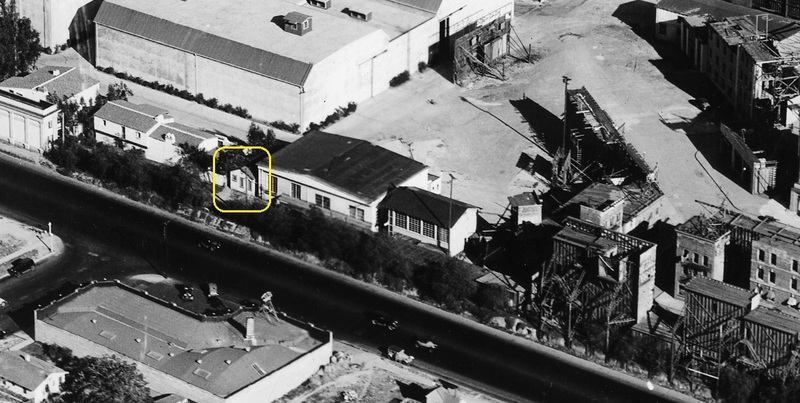 One question though, in those 1930 aerial shots, can we see the offices across the street from MGM where Keaton first housed himself and his production staff when he made THE CAMERAMAN for MGM? Harold Goodwin recalled the following in a 1977 interview: "Buster's bungalow [when we made THE CAMERAMAN] was across the street from the studio on a side street, Madison Avenue. The studio later bought that land and the Thalberg Building is there now, but back in 1928 there were three little bungalows, and Buster rented one of them." Update - I just re-read John's post on this topic; he identifies the Thalberg Building's location as Grant Avenue, not Madison; and he includes a photo showing three adjacent bungalows on Grant that are across the street from the MGM lot. I'd reckon that Buster rented one of those units, which from the photo appears large enough to accommodate Buster, his director Eddie Sedgwick, the writers, and his cook, Willie. Harold Goodwin remembered that the other two bungalows next to Keaton's were rented by two other MGM stars - Lew Cody had one, William Haines the other, dispelling the notion in some Keaton biographies that Buster was the sole offsite "rebel" among MGM's employees. The full aerial photos, and Sanborn maps, show that Grant Ave. ran ~ east west, for a short block terminating at Madison to the east, which ran ~ north south. Madison had a funeral home on the SW corner of Grant, and a gas station, but no homes. I can't account for Harold's recollection, but as I mention in my post, Keaton seems to conflate the actual bungalow home off campus, and his small "Kennel" on campus.